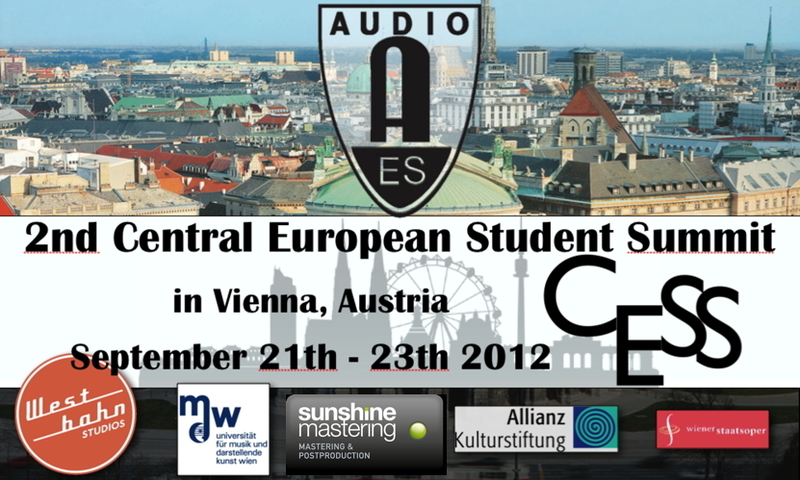 der Kopf denkt, das Ohr lenkt..
we are happy to announce our program scheduled for the 2nd Central European Student Summit! We have more than 50 students from all over Europe who visit us in Vienna and participate in this unique event. We made it for you, so spread the word upon your fellow AES students!!! The date of the summit is the 21.-23. September 2012. The hostel we booked for you is in the center of the city on the opposite site of the famous „Naschmarkt“. If you are lucky and get checked-in in a room on the top floors you have an amazing view over Vienna (see the pictures on the hostel homepage). We will see you at the meet&greet at 8pm inside the hostel at the womBar with a free drink! – Your participation warranty for all workshops taking place during the CESS (Mischa Janisch Mastering Workshop at Sunshine Mastering, Mandy Parnell Mastering Workshop at Sunshine Studio, Seigen Ono „acoustical surround recording with height (9.0ch)“ Workshop at Westbahn Studio). – Your accomodation for 3 nights (21.-24. September) including breakfast at the Wombat’s Hostel at „Naschmarkt“. – Your participation warranty for the homemade Pizza event (don’t worry, you will EAT pizza, not make pizza ;)). – Your entry warranty to the CESS Party. – Your participation warranty for all workshops taking place at the CESS (Mischa Janisch Mastering Workshop at Sunshine Mastering, Mandy Parnell Mastering Workshop at Sunshine Studio, Seigen Ono „acoustical surround recording with height (9.0ch)“ Workshop at Westbahn Studio). – Your participation warranty for the homemade Pizza event (lunch sunday). – Your entry to the CESS Party. There will be a special audio related tour through the Vienna state opera which is limited in the number of participants. If you wish to take part, try to be one of the first students registered for the CESS and also check the box for the tour in the formular at the bottom of this page. Due to the limited slots, only the first applicants will be able to attend this tour. There will be lectures and a roundtable of professionals. These lectures are open to everyone, so invite your friends to join! The exact lecture topic and lecturer is still to be announced, so stay tuned. There will be workshops (in smaller groups) in several studios in Vienna. There are social events and there will be time to explore Vienna. 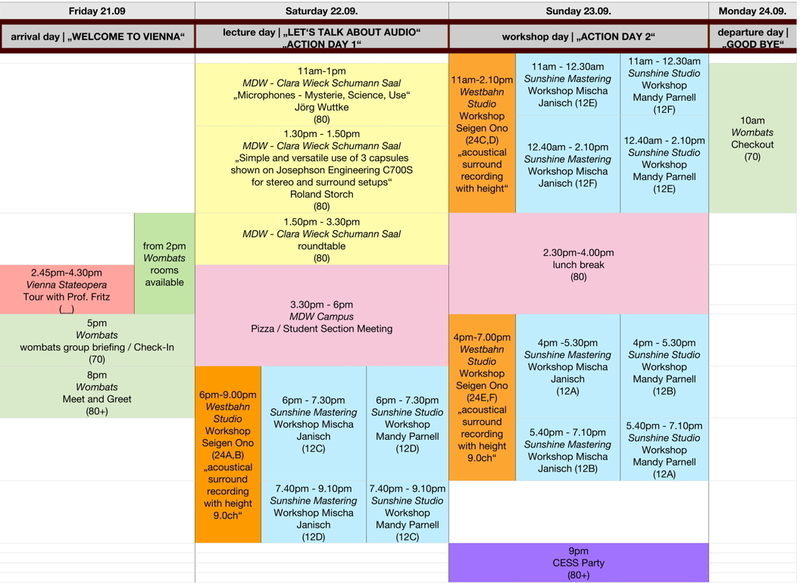 Please click on the timetable to enlarge and see the full program. The mastering workshops will be held in groups of 10-15 students. The recording workshop will be held in groups of 24-30 students. You can look up the Groupletters „A-F“ in the full programm to see which group attends which workshop at what time.